Berlin may be an art-filled city known mainly to hipsters, but it also makes for an ideal family destination. For one thing, it’s very easy to get around the city whether on foot or by public transport. In addition, adults will want to learn about the Cold War and see the Wall that once divided the city, two excellent ways to introduce kids to an important part of global history. Berlin with kids means countless opportunities to entertain your young ones in parks and museums, in eateries, and through culture. Equip a child with a camera and they’ll happily go around Berlin. Here is our list of the top ten things to do in Berlin with kids. When you’re in Berlin with kids, you’ll want to do as much as you can without breaking the bank. Entry fees to major attractions, museums and bus tours can add up. If you’re planning in advance, book a Berlin Welcome Card for discounts. 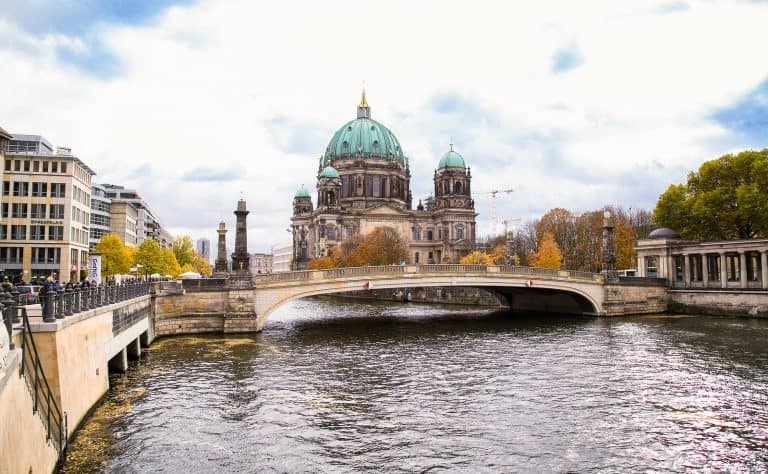 Distributed by Visit Berlin, it offers over 200 sights and attractions including the five museums on Berlin’s Museum Island. It also includes discounts to many hop-on/hop-off tours, theaters, restaurants, and shops. You can also purchase unlimited public transport in Berlin Zones ABC, super helpful when traveling in Berlin with kids. Children between the ages of 6 and 14 can travel free with a parent or adult. You can purchase a Berlin Welcome Card at Am Karlsbad 11, 10785 or online. Berlin is Germany’s largest city and it’s impossible to walk everywhere. 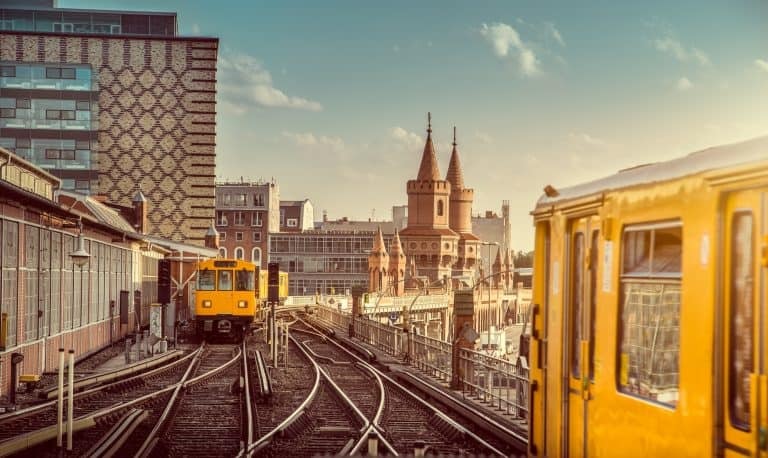 The city’s public transportation, the S-and U-Bahn, is very good and reliable. Buses and trains run at night, and S- and U-Bahn provide a 24-hour service on weekends. On weekdays, night buses and the Metrotram are available throughout the night. Simply walk around on foot if your kids are up to it. More active families will love that the city is bike-friendly. You’ll find plenty of dedicated bike lanes, as well as rental shops all over Berlin. If your kids are old enough, go on a Segway tour with a company such as Berlin City Segway Tour and one of their guides. 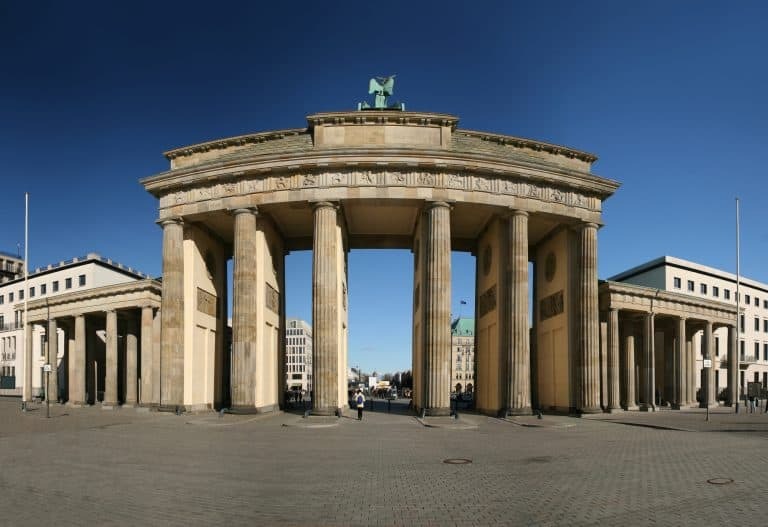 Their tours tell you the history of Berlin and make the city accessible to the entire family. The Berlin Television Tower is the tallest building in Germany. Your kids will love the panoramic views of the city. The Tower gives viewers a 360 degree of the city, offering interesting Instagramming opportunities for tweens and teens alike. Its steel sphere contains a visitor platform and a revolving restaurant. If you plan in advance, purchase a Fast View Ticket to avoid a long wait. It will also give you a restaurant reservation. The best thing about the TV Tower? Kids will love the high-speed elevators to get to the top floor and the fact that the tower turns. There are full descriptions of what you are seeing at every point, laying out important landmarks that are visible. These include the Reichstag building, the Spree river, the Brandenburg Gate, Museum Island, Potsdamer Platz, among others. The Television Tower is located at Panoramastraße 1A and is open from 9am-midnight daily. Find deals on family-friendly hotels in Berlin. Checkpoint Charlie is the famous crossing point between East and West Berlin, known from the Cold War. Here you’ll find an East German watchtower and a museum exhibit of the history of the Berlin Wall. It’s a necessary stop when visiting Berlin with kids. Part of the museum is free to the public and located outdoors. Inside you’ll find photos, stories, and remnant artifacts from those who attempted to flee from East to West Berlin. The artifacts are actual items people used to flee such as submarines, cars, planes, a hot-air balloon, and historical documents. Checkpoint Charlie is located at Friedrichstraße 43-45. If you are staying at Regent Berlin and want to splurge on a meal one night, walk a few blocks in your best frocks to Restaurant Aigner. The restaurant offers a combination of German and Austrian cuisine. 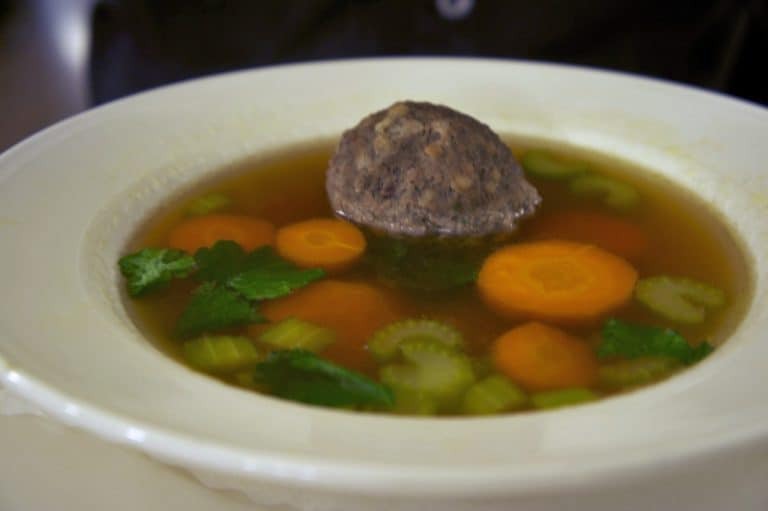 It specializes in classic dishes kids will love including; chicken schnitzel, Nuremberg sausages, German meatballs, Brandenburg duck with creamed cabbage, and Berlin-style calves’ liver. To top it off, the restaurant uses fresh ingredients and there is a great ambiance. Do make a reservation in advance. Note that they do not offer kid’s meals, but meals can be shared and are memorable. Restaurant Aigner is located at Französische Straße 25, 10117. 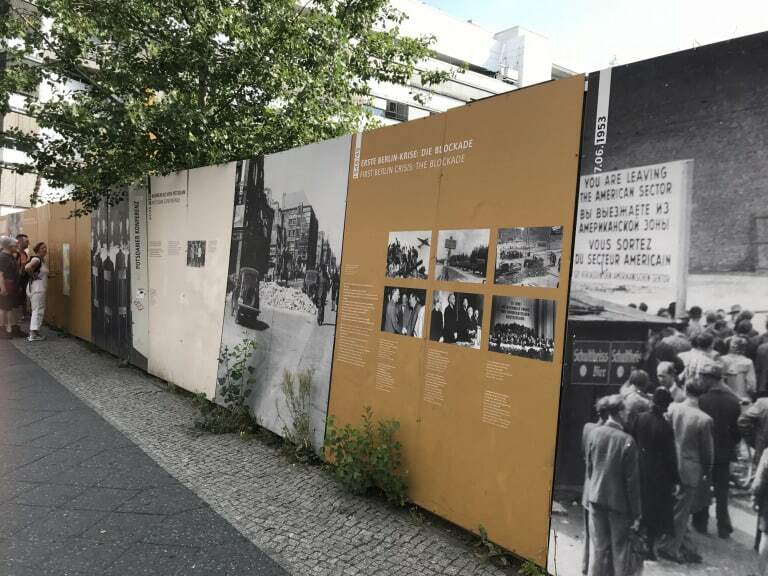 One of the more sobering things to do in Berlin is engage your children in the history of World War II. 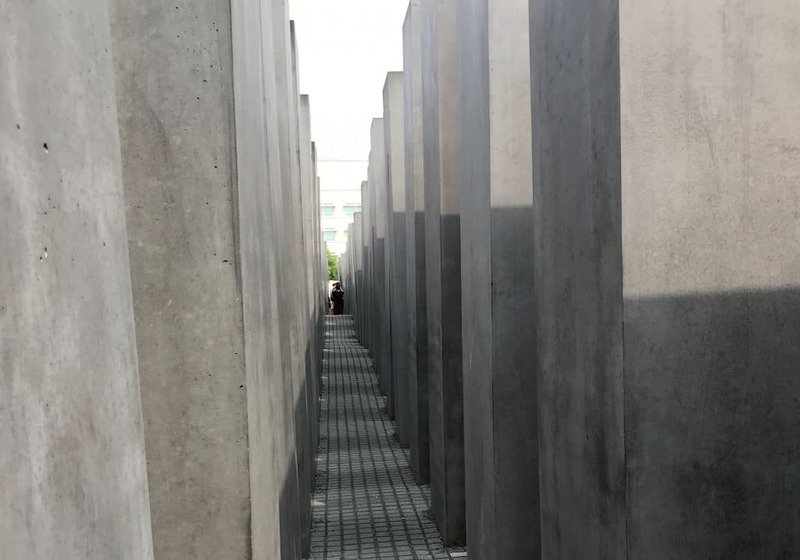 A visit to Berlin with kids is more complete when you absorb every angle of history and integrate education in your sightseeing, so a visit to the Memorial to the Murdered Jews of Europe is worthwhile. Located on the ground, it appears to be a number of boxes of coffins There are 2,711 in total. The nature of the memorial might not even be obvious to the passerby at first glance, but the installation has a great deal of meaning. Walking through it is like a maze, with no end. It feels haunting yet important. If you have time and your kids are tweens or teens, venture into the museum underground where there is more information, historical photographs, and film footage on the dreadful events that transpired during World War 2 to the Jews. The Memorial to the Murdered Jews of Europe is located at Cora-Berliner-Straße 1, 10117. 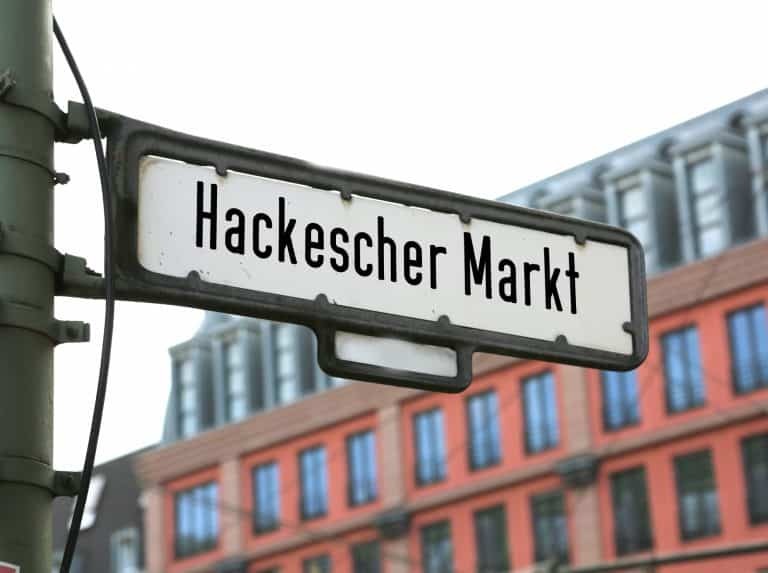 The Hackescher Markt is located in Mitte, just outside the S-Bahn station Hackescher Markt. Its courtyard offers a number of cafes, restaurants, galleries, bookshops, and shopping options. There are buskers (street performers) playing music in the middle of the square, which you can hear from your table. You may catch sight of an artist working on a masterpiece, as well. Plus, there is nouveau architecture to inspect, such as Hackescher Hof, built in 1907. For shopping, head to Rosenthaler Straße and Oranienburger Straße, as well as Weinmeisterstraße and Münzstraße leading up to Alexanderplatz, and pop shops. If your kids need a dose of pizza or pasta, head to Trattoria Ossena. There is no cheap food in the square, but it sure is a fun experience. Ossena is located at Neue Promenade 6, 10178. Berlin has a fair share of beautiful parks and palaces. 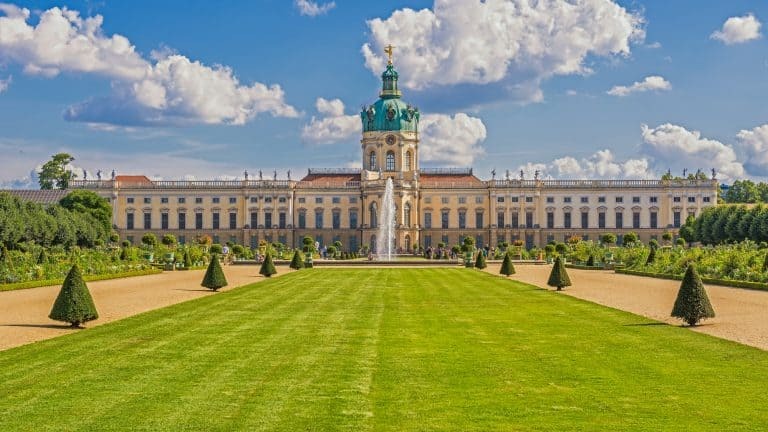 Don’t miss the Botanic Garden and Botanical Museum, popular at all times of the year, or Charlottenburg Palace, Berlin’s most regal palace that was built at the end of the 17th century. Gardens of the World at Marzahn Park is a gorgeous park that features a cherry blossom festival and tea ceremony. Schloss Glienicke is a Mediterranean palace on the banks of the River Havel in Berlin. If you happen to be in Berlin during the holidays, take your kids to the Palace’s Christmas Market with over 250 vendors. 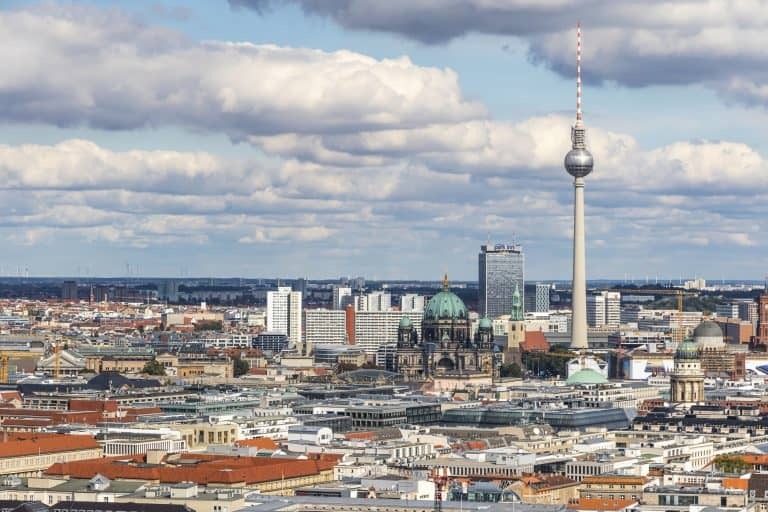 Berlin is a wonderful city for art lovers – both children and adults alike. There are hundreds of galleries and it’s home to thousands of artists. You’ll find traces of art all over the city in the form of murals and graffiti. You don’t want to overdo it with kids in tow, so do set a plan. A good place to start is the Neue National Gallery, a famous art gallery known for its huge collection of 20th-century art. Then head to Hamburger Banhof, a contemporary art house with art from the National Gallery. If you have time, head to Museum Island, where you will find Pergamon, Bode, Neues, Alte Nationalgalerie, and the Altes Museum. Check entry fees before you go and find out which ones are free – many are. Planning to drive in Germany? Here are our tips for driving in Germany and Eastern Europe. 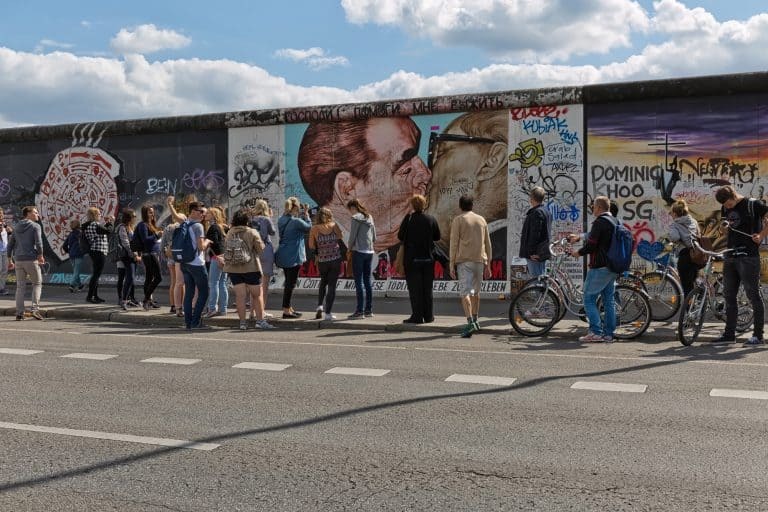 For a treat, head to the East Side Gallery, located outdoors on Muehlenstrasse, a must for your visit with kids in Berlin. It’s an actual part of the wall that runs for 1.3 km and consists of over 100 paintings by artists from around the world. The paintings have been subjected to graffiti and protests over the years and truly symbolize the city’s history. Paintings include “The Kiss,” between leaders Leonid Brezhnev and East German President Erich Honecker, and many others that are very famous. The visit is free, very Instagram-worthy, and a wonderful way to end a trip to a city stamped with as much struggle and freedom as Berlin has. East Side Gallery is located at Mühlenstraße 3-100, 10243. Take the S5, S7 or S75 down to Warschauer Station, turn left (south) all the way down Warschauer Strasse until you get to a big bridge. The outside gallery will be to your right. 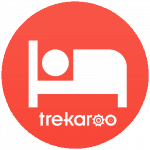 Check out amazing deals on hotels in Berlin. There are so many things to do in Berlin but don’t miss a visit to Potsdam, situated on the River Havel, 15 miles southwest of the city center. You’ll find beautiful architecture and landscapes dating back to the 18th and 19th centuries all over the city, including Babelsberg Palace, which happens to be a UNESCO World Heritage site. 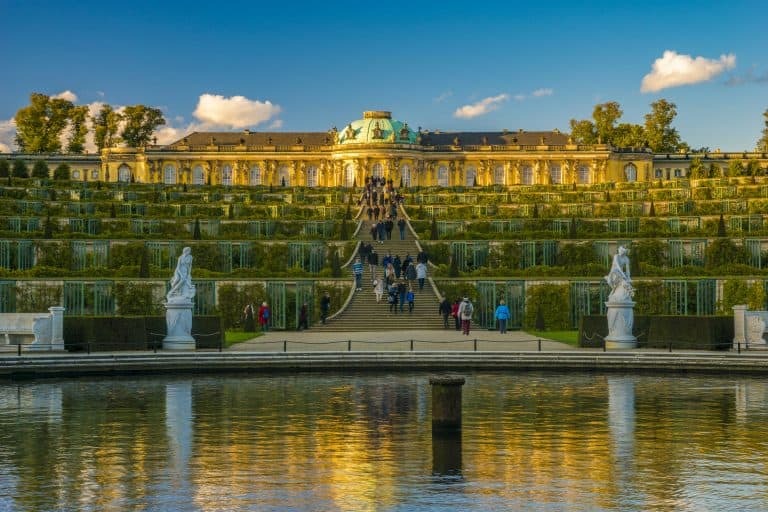 Take the S7 S-Bahn to Potsdam, head to the Sanssouci Palace, the New Garden, the stunning Park of Babelsberg, Alexandrowka, and the Sauveur Church. If you have time, and you have film loving children, stop at Babelsberg Film Studio where films such as “The Pianist” was shot, as well as many classic films. Families traveling to Berlin with kids who love five-star hotels will love the Regent Berlin. For one thing, its location is superb, with close proximity to the Gendarmenmarkt, Brandenburg Gate, and Reichstag. Plus, the Friedrichstraße S- and U-Bahn are nearby. The hotel is as elegant as it gets, which can only be a treat for adults and children alike. 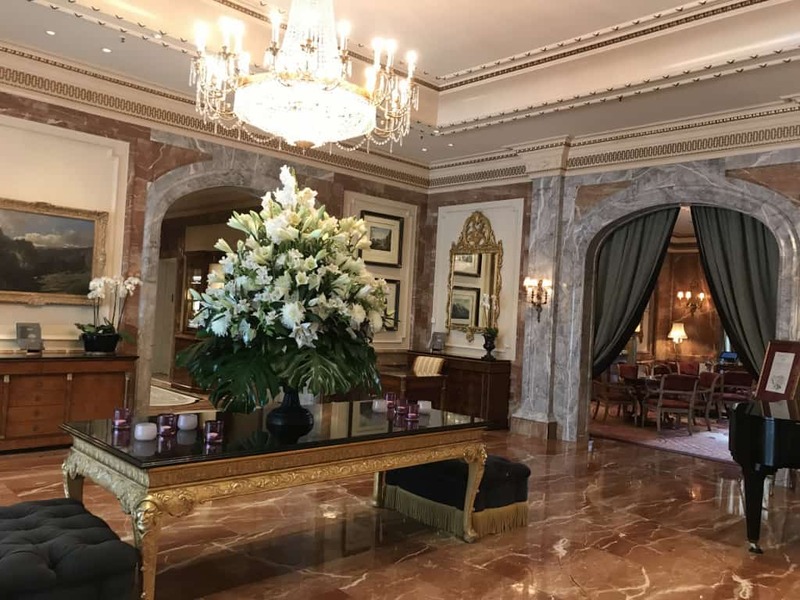 You will feel the opulence as soon as you enter the hotel, with its regal chandeliers, Biedermeier furnishings, and old-world oil paintings every which way you look. The staff at reception is kind and the rooms are spacious, cozy, and fully equipped with all the things families need – from Nespresso coffee makers to TVs to deep bathtubs. The deluxe rooms and suites all have views of Berlin. There’s also a restaurant and lounge for families to grab food and drinks in. Regent Berlin is located at Charlottenstraße 49, 10117.